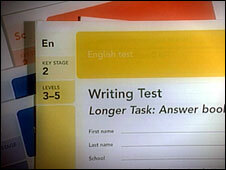 Schools in England are trying to track down national curriculum test papers mislaid by the Sats contractor, ETS. Some have been sent back to the wrong school, but promises that they will be retrieved have not been kept. Some schools continue to have pupils marked "absent" in the ETS database even though they took the tests. Conversely the BBC has heard from one that has been allocated marks for two pupils who genuinely were absent. • The Priory School in Southsea, Hampshire, was unhappy about the consistency of Key Stage 3 English marking. In preparing papers for appeals, staff realised the list of results for the writing test, published by the National Assessment Agency, included scores for two pupils who had not taken it, and who had been recorded as being absent from the room. • Rose Green Junior School in Bognor Regis, West Sussex, was trying to locate 30 missing English test scripts when it was contacted by Whiteways Junior School in Sheffield, South Yorkshire, which had been sent them. The National Assessment Agency was told on 15 July and promised to arrange for them to be picked up the same day. The papers were still in Sheffield on 23 July. • Some schools are invoicing ETS for the time spent dealing with problems with the tests. The head of a large primary in Manchester has sent a bill for £350 with a letter "setting out the more obvious costs in supply cover and admin time in trying to sort this fiasco out". • Reports continue to come in of missing scripts and questionable marking. Ian Kendal, head of St Joseph's Catholic primary in Hertford, Hertfordshire, said: "Our Science scripts have not yet been marked. The National Assessment Agency has informed the school that the scripts are not lost; they just don't know where they are!" Phil Thomas, head of Wey Valley School and Sports College in Weymouth, Dorset, said: "We received the results in a print out four hours before the end of term. This format meant that staff had to retype the data into computers for us to start the analysis. "Fortunately, the papers arrived the day before so unusual marks could be investigated. 39 'borderline' level 5 papers have been returned after pages of answers have received no marks and the standard of marking is extremely variable." 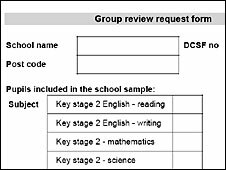 • Schools had complained about the deadline for submitting appeals - that is, requests for marking to be reviewed. It had been extended from 18 July to 10 September, but it was pointed out that this was only two days into the new term in some areas. So it has been further altered to "10 days after the start of their term, or after receipt of both scripts and results, whichever is the later". Figures published on Tuesday showed that about one in five primary schools still lacked results and almost a quarter of English results for 14-year-olds were missing. "Most feel this has been a total let down. Their kids have been through all this stress, and the parents have been through it too. "To hear the secretary of state on the radio, when challenged, not going to take responsibility and say it is a matter for the Qualifications and Curriculum Authority (QCA) and ETS is not right. "What's making it even worse is that now all the ministers have gone off on their 11-week summer holidays and parents are at home with children who still haven't got their results." This morning I had returned 6 packets of KS3 science SATs. Some of them are marked and totalled, some are marked but without totals, some are not marked AT ALL and some belong to another school. This adds to the chaos of last week's return of KS3 English SATs papers - some of which were marked and some of which were not. What a farce! Maths SaTs for Crofton School Lewisham still not arrived. 30 scripts went to Crofton school in Hampshire but still no sign of the other 150!!! At Yewlands School, Sheffield, KS3 English results arrived on the last morning of term just before staff had to vacate the main building ahead of its impending demolition. Weirdly, the ETS results sheet showed no marks for any pupils whose surname begins with letters A,B,M,N and O. We still don't have these results and nor do we have exam scripts to begin the arduous process of explaining a case for marking review. Why on earth should this process colour the early days of a new school year when there is so much else for staff to do? I applaud the attempts of schools who have sought reimbursement from ETS but I think they should also pay teachers who, in their own time, have to study scripts, mark schemes etc. to secure reviews that would not be necessary if ETS had properly fulfilled its responsibilities in the first place. We recieved our KS3 English SATS papers last week and sent them straight back for remarking- we had forms stating that pupils were absent stapled to their completed, marked examination papers! Marking was dire with our percentage of level 7s dropping from nearly 60% last year to about 20%- similar cohort of kids, same teachers teaching. Pages had not been marked and almost all of the Shakespeare papers had been awarded the same mark!!!! I am a marker for SATS key stage 3 English. I have marked for 4 yrs. I had problems receiving papers and had a few gliches with ETs system but was happy with the end result. I had no problem uploading my marks or in verification. At one point I had verified a pupil absent instead of present and could not enter the marks but i phoned the help desk and it was rectified immediately. I would never have sent papers back without entering marks. I know ETS has had many problems but my experience was not all bad . My marks and papers were all in one week early. Also, if Mr Cameron had been in power would the result have been different in that it is the Naa that appoints the contract. Why did top English grades fall? Who are the low achievers? The end of league tables? Tests - do we still need them?